Part Number: AR1500M. Reach peak performance and get the kind of high quality audio you deserve with the Boss Audio AR1500M 1500 Watt Mono Amplifier. 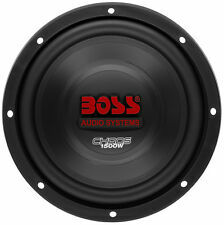 Choose the Boss Audio AR1500M 1500 Watt Mono Amplifier for the ultimate in car audio. This Amp. is very easy to install and really makes a huge difference with my sub woofers. I have bypassed a built-in amp in an Omega 12" amplified. The Omega's amp went out so I mounted this Boss bad boy to the top of the tube with long wood screws and wired it up. It hit so hard that I bought this second one and bypassed the wimpy amp in my new Pyle 12" amplified tube. That Pyle is kicking good now. I do recommend this Boss amp. and believe me this amp has a lot left in it I can not even touch with just one 12" on it. I bet it could bust windows driving two 15" woofers. Can you dig it. So far the amp has worked well. My only complaint is if you listen to your music loud for an extended period in warm weather the amp will overheat. Besides that, for the price it's a good value. Excellent, budget friendly, easy install amp!!! I had my doubts when I placed my order (I mean, how good can an amp be for under $60) but after an easy install, I was very pleased! I'm using my Boss AR1500M to power two 10" Kicker subs and it does so with ease. This was my first install so I was a bit confused by how much amperage I would need. The Boss AR1500M sorted all that out an is giving me the power I need at the price I could afford. Give it a try, you won't be disappointed!